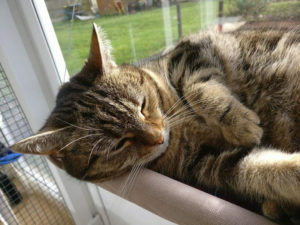 We have a some long term foster cats – cats who cannot be homed either due to their age or medical/psychological issues. Em, gorgeous Em lives long term at our centre as she does not react well in a home environment and reverts to feral behaviour. After three homing attempts we realised Princess Em was far happier being adored and worshipped at the centre. Lottie and her siblings Lulu, William and Womble were born in August 2011. Their mother Lois had been made homeless whilst heavily pregnant when her owner died and no one wanted to take her in. CCG Trustee and Fosterer Nicky took Lois home and settled her into a kittening pen. Just a week later she gave birth to 6 small and very weak kittens. Sadly, two of them died within a few days. Three weeks later it became obvious that Lottie was developing very differently to her siblings. Her head swayed from side to side dramatically and she had trouble walking in a straight line. Angie and Judith were summoned, and a visit to the vet was arranged. Ross confirmed that Lottie had been born with neurological damage caused during development in the womb which was stable but not treatable. In his words, Lottie was worth fighting for but would either “thrive, or break your heart”. We decided to let nature take its course, and to our amazement she survived being weaned onto kitten food, and began to grow stronger. Her head sway became less obvious as her neck muscles strengthened, but when she was spayed the vet found that she has a heart murmur and also cataracts in both eyes. This made rehoming her even more of a task as she was not suitable for a home with children, and needed to be somewhere stable and quiet. It was decided that she would stay with Nicky long term as she was settled with her, and had other cats and the dogs for company. She knows the house and routine and is more than able to hold her own, explore and play. She still sways when she walks, and often circles whilst doing it as if she`s trying to decide what to do!Last May she had a freak accident one Saturday night in the house and broke and dislocated her back leg. Another trip to Ross the vet for advice meant 6 weeks on strict cage rest whilst it mended, as we felt major surgery was not in her best interests due to her disabilities. She soon adjusted to life back on the kitchen table, gourmet food on tap, with her friend Lily lying next to her for company. She`s back to normal now, able to climb and run just as before. 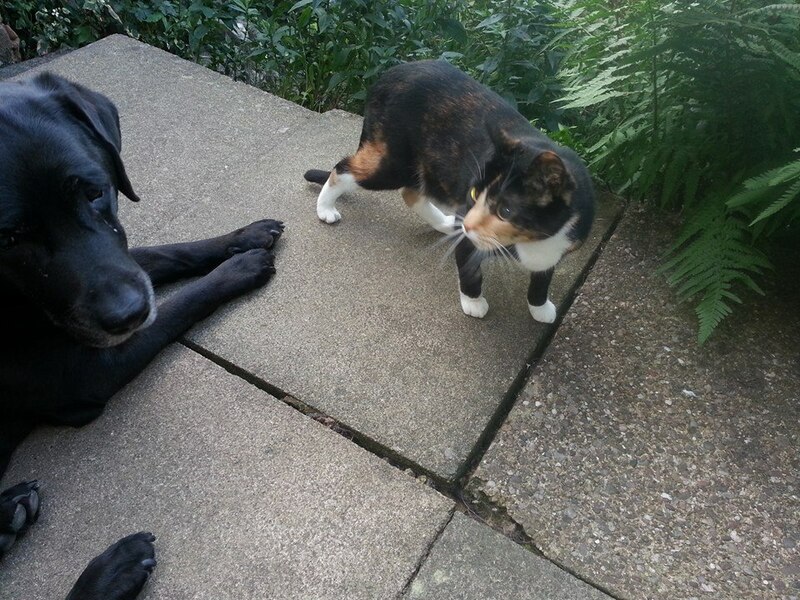 Lottie has a good quality of life, she has company, room to play and last summer was strong enough to go out into the garden under strict supervision for a few hours. She is not a lap cat, rather likes to watch from a safe distance and has a very determined streak. Her favourite toy is the ball track, she spends hours pushing it round and watching and waiting for it to come back to her. A remarkable little cat, strong in spirit and determination to get the most out of life. The lovely Friday, so called as he was found straying around TGI Friday’s in Binley! 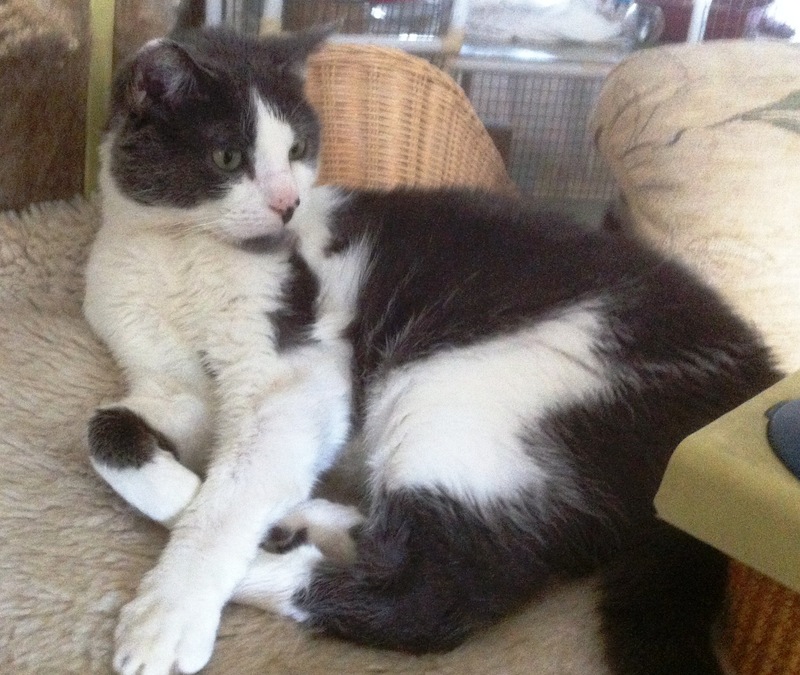 A gorgeous big cat, friendly and fussy, but unable to be homed due to his habit of pooping in his sleep – bless him! Now living happily with a long-term foster carer and supported by Coventry Cat Group.